If you want to create a fun and comfortable spot for your betta, there is nothing better than a hammock. They are affordable, look great and best of all – betta love them! And today, I am going to teach you everything you need to know about them. 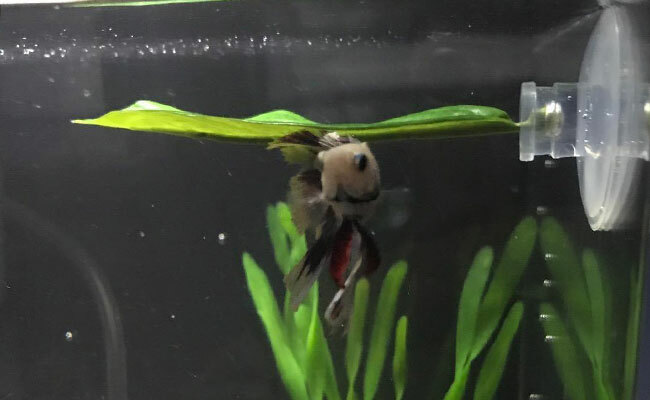 What is a betta hammock? What are the benefits of a betta hammock? Does your betta need a hammock? Where should I place my betta hammock? My betta won’t use his hammock. What do I do? What are the alternatives to betta hammocks? You thought of this, right? I know I did. Well, I would have if I hadn’t spent the last 10 years raising betta. You see, a betta hammock looks a little different than the hammock above. Betta hammocks are essentially a flat surface that sits underwater and attaches to the glass of your aquarium with a suction cup. 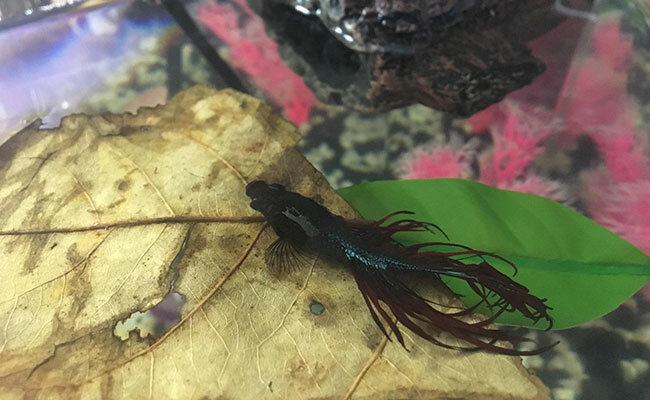 While there are many different types of betta hammocks, the most common style resembles a leaf. A betta hammock provides your betta with a safe spot to rest and relax. It’s no secret that bettas enjoy a good nap. And, bettas can sleep in some odd spots. You may find that your betta sleeps floating, head buried in your substrate or even hidden among your plants. But by far, the most popular place for bettas to chill is just below the surface of your aquarium. 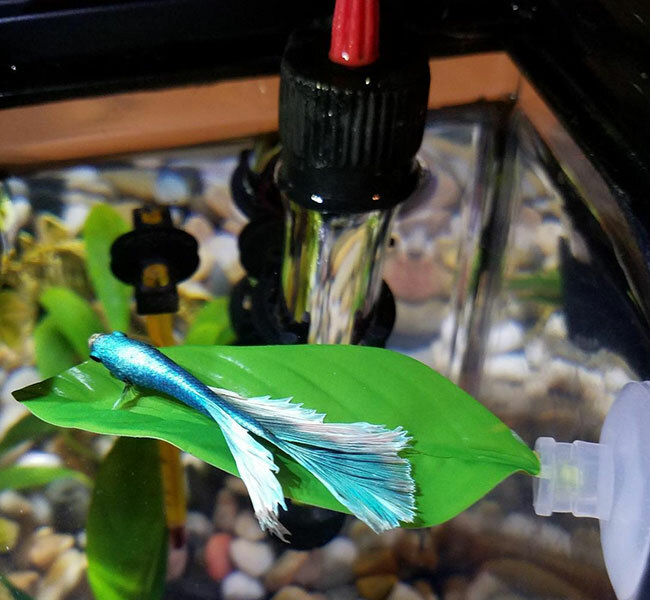 Simply place a betta hammock just below the surface water, and your betta will have a comfy place to sleep – think of it as a bed for your betta. Did you know? Betta fish sleep with their eyes open. This allows them to quickly escape from any predators that try to sneak up on them while they sleep. 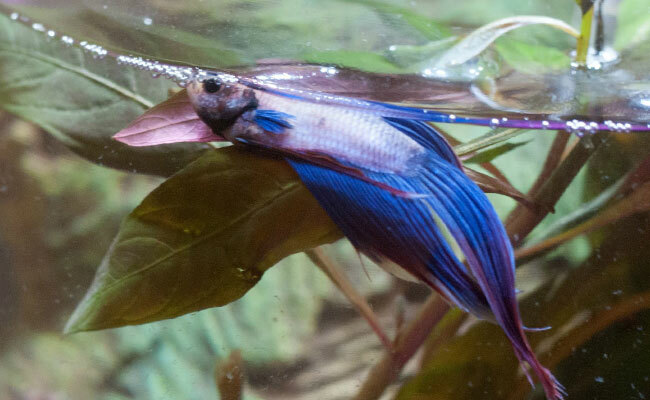 Check out our guide to betta sleep to make sure your betta is getting enough shut-eye. Bettas are one of a few fish with a labyrinth organ. Think of it as a lung – this organ allows your fish to take a breath of air from the surface of the water. Occasionally, gulping for air is considered normal behavior and has been observed among bettas that are happy and healthy. Many bettas that we own have been specifically bred to have large fins. 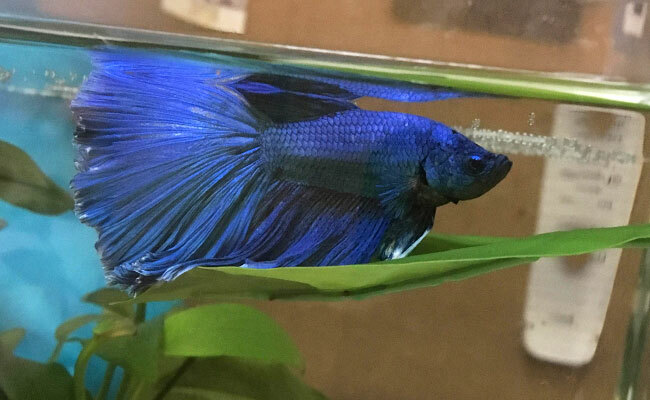 While these fins may make the betta impressive to look at, they do have a downside: They make it more difficult for your betta to swim to the surface and stay there. 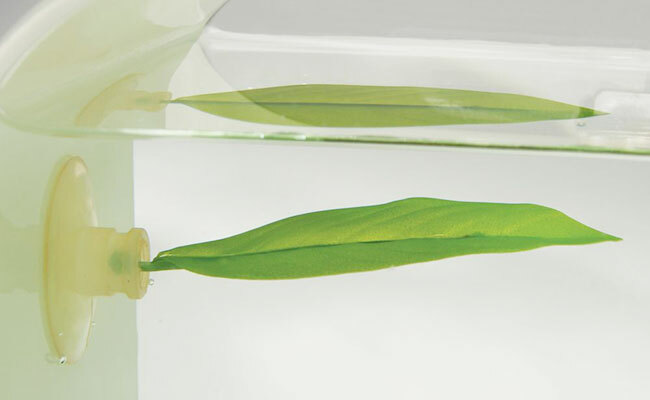 By placing a hammock just below the surface, your big-finned betta will have a place to rest while he gulps in air. Most bettas are drawn to hammocks like a magnet and will happily spend hours just chilling in their little spot near the surface. Since bettas seem to be naturally drawn to hammocks, installing one in your tank could make your betta happier. Cleaning time? A betta hammock can easily be removed when you wipe down your tank. When you are finished, simply place it back. 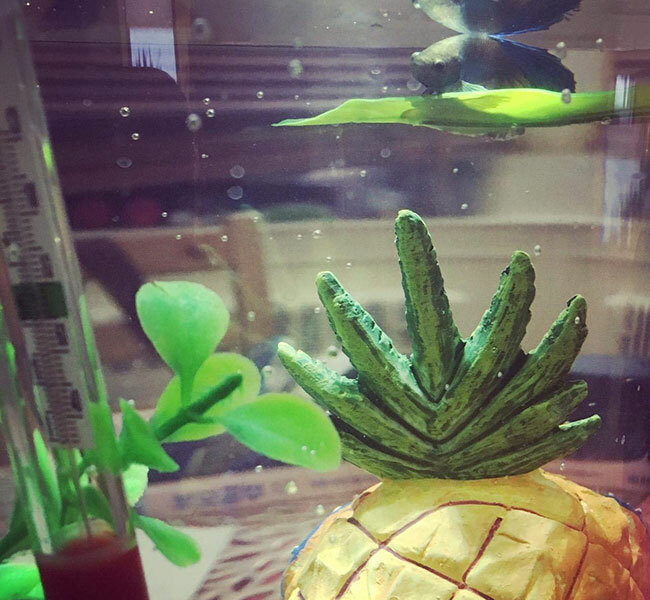 If you have taken up the entire bottom of your aquarium with SpongeBob’s pineapple and other fun decorations or plants, then you might not have room leftover to provide your betta with a comfy spot to chill. A hammock sits at the very top of your aquarium, allowing you to decorate below however you see fit. A betta hammock is by no means an essential aquarium accessory. 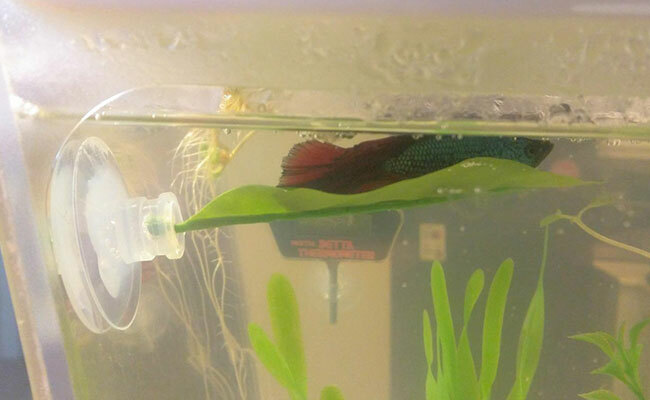 In fact, if you can provide your betta with an alternate spot to rest, then you can skip the hammock altogether. I personally use live plants in my aquarium. While they do require grooming, plants with wide leaves can provide your betta with a comfy place to chill. A more hassle-free approach could be to use a tall fake plant – remember, silk is best and won’t tear your betta’s delicate fins. Even so, I have used a betta hammock in my hospital tank. Moon, my adopted veiltail betta, appreciated having the hammock to rest on while she recovered from a nasty bout of fin rot. If you can provide your betta with an alternate flat surface to chill on near the surface of your tank, then skip the hammock. But if you can’t? Grab one. They only cost a couple of dollars and can result in a visibly happier betta! 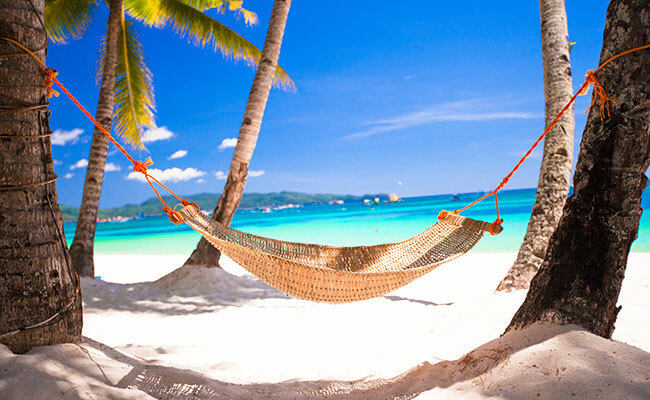 Instructions on most hammocks recommend that you place it ¾ inches (2 cm) below the surface of your aquarium. Really, you can place it at any height. Experiment. You might find that your betta is just as happy chilling in his hammock halfway down your aquarium. Your betta will actually clue you in as to where you should place your hammock. If your betta sits on the suction cup instead of the hammock, then he is trying to tell you to raise the hammock closer to the surface so that he can gulp air easier. … Or anything else that causes water movement. You see, betta fish don’t like too much water movement. If you place your hammock in a strong water current, your betta will not sleep or rest on it. Bettas are tropical fish, so your tank should have a heater installed to keep the water at a constant temperature. Try to avoid placing your betta’s hammock too close to the heater. Your betta will snooze here, and if his delicate fins rest on the heater, they could be damaged. Remember: Before you add anything to your aquarium, including a betta hammock, rinse it in dechlorinated water to remove any chemicals and other nasties remaining from the manufacturing process. While most bettas love their hammocks, others refuse to go anywhere near them. Let’s take a closer look at why your betta isn’t using his hammock. First, you want to consider the placement of your hammock. As I discussed earlier, if a current flows by it, then your betta probably won’t rest there. Bettas often use hammocks to rest. And, nothing is relaxing about a strong current pushing you off your leaf. Move your hammock to a nice, calm spot in your aquarium, away from your filter outflow, bubbler and anything else that causes water movement. Your betta will be much more likely to take to his hammock. Even with the hammock in a calm spot, your betta may refuse to take interest. Spend some time watching your betta, getting to know his habits. You might find that his favorite spot to hang is toward the bottom of your aquarium. By moving the hammock to your betta’s usual resting place, your betta may choose to use the hammock instead. Bettas like to sleep at night, in darkness. If you keep your lights on 24/7, then your betta might prefer to use the hammock as a shady spot to escape the harsh light rather than climbing on top. Use a good aquarium timer or turn your lights off manually each night. With a day/night sleeping schedule in place, your betta will be more likely to use his hammock. While most bettas are naturally attracted to hammocks, there are some that just don’t get it. 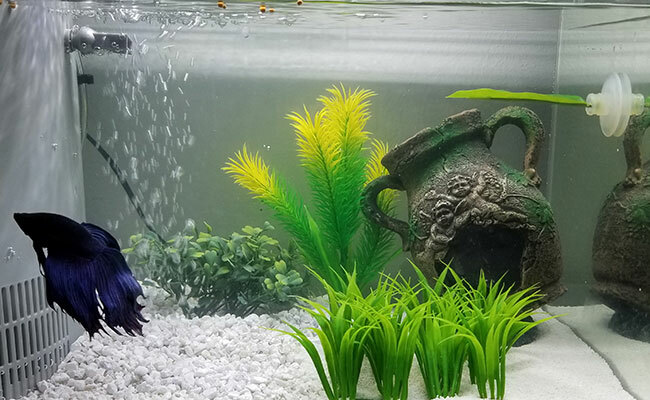 Unfortunately, you can’t explain to him that you spent good money on his new comfy resting place – it turns out that fish are pretty bad listeners! By feeding your betta just above his hammock, he may begin to associate it with the wonderful feeling of feeding time and actually use the darn thing. No, when used correctly, betta hammocks are not dangerous. Washing your new betta hammock and cleaning it regularly will ensure that it remains a safe bed for your betta. Just like ornaments and fake plants, the hammock can collect uneaten fish food and other gunk. A quick wipe down while cleaning your tank will keep it in tip-top condition. When cleaning, you should inspect your leaf to make sure it has not started to deteriorate. 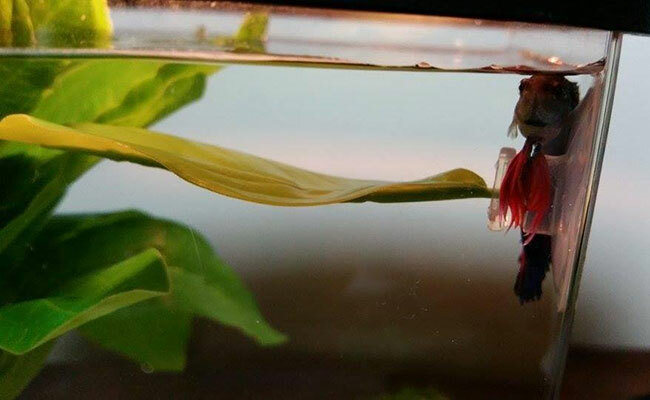 Some leaf-style hammocks contain metal wire so that it keeps its shape when your betta rests on it. If the hammock becomes damaged or deteriorates, this wire can poke through and rust – or worse, tear the fins of your betta. If you notice this, immediately remove the hammock from your aquarium and toss it in the trash. Betta hammocks are cheap, commonly available and just work. It is for that reason that they are the most popular way of providing betta with a comfortable spot to chill. If you are not feeling a hammock and want something more natural, tall plants with wide leaves can be used to achieve a similar effect. Another natural option is Indian almond leaves. Bettas love to rest on these large dried leaves. Plus, they have other benefits that will keep your betta tank healthy. 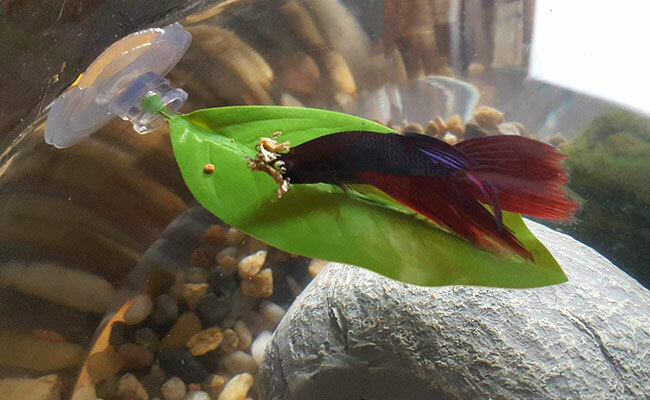 Take the betta below – he chose an Indian almond leaf over his hammock. 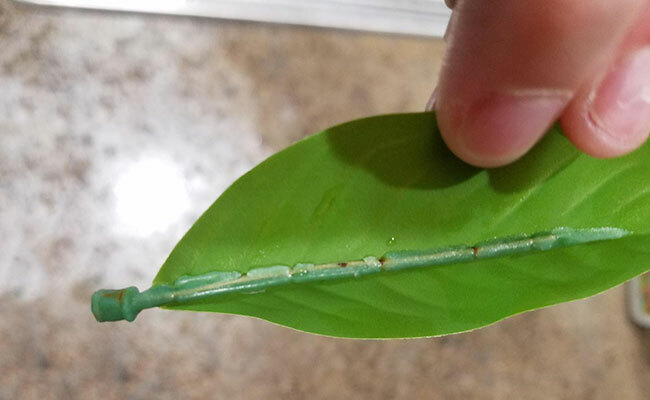 Be mindful that Catappa leaves will deteriorate over time and release tannins into your aquarium, which can cause your water to turn yellow. It’s not a bad thing, but many people don’t like the effect. You could also use tall ornaments. However, these need a flat space on top for your betta to sit comfortably. Your betta will enjoy chilling at the top of your aquarium. 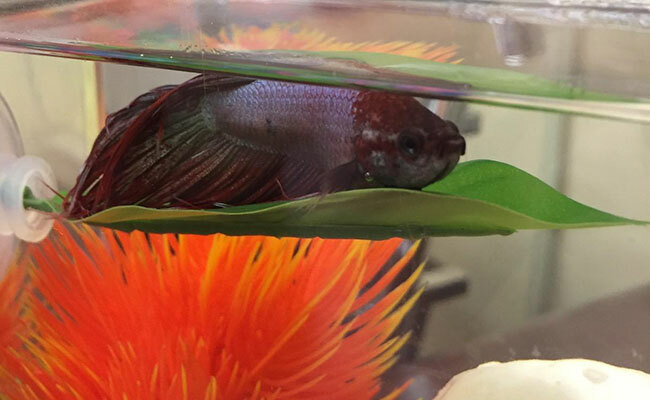 And, a betta hammock allows him to do so in comfort and style. If your tank is missing a resting place near the surface, then grab one today – your betta will be happier for it! Do you use a hammock in your betta tank? Let me know in the comments below! I loved your articles, got addicted to it. If i can also offer tips, what i do is to get some plants like fox tail and instead of burrying, roll them up like u do with paper to toss it away and leave it floating on the extreme side away from the filter. it will stay there and the bettas LOVE to stay there, hidden, even hard to find. I did find they also LOVE very snuggle caves. What an adorable little betta. I love the idea of the fox tail hidey-hole. 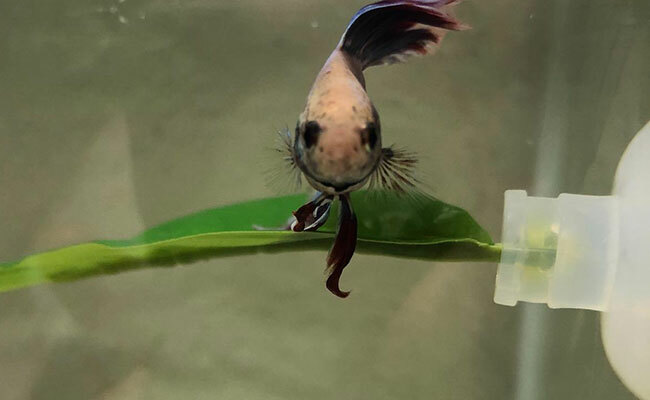 That is an adorable pic of your betta. I’m sorry for your loss. You sound like a wonderful owner. Ours sure loves hers! It’s just so cute to see her snuggle up on it. Great and fun information in this article- keep it up! I’m glad to hear your betta is a hammock lover. It’s adorable to see! Thank you for the kind words. I have 2 male Dumbo Half Moon Betta’s. Tim has huge fins & prefers the Betta Hammock. Rusty is not as big & his fins are not quite as large as Tim’s. I suspect Rusty is much younger. He prefers snoozing in his floating Betta Log. We did anchor it to the side to keep it from floating into the filter flow. He clearly didn’t like that. The log is his number 1 place to snooze! That’s hilarious, It’s funny how betta each have their own unique personalities and likes/dislikes. I’m glad you figured out what Tim and Rusty like best! Each betta has their own unique personality. It sounds like you have an odd one. Don’t worry, you’ll figure him out soon enough! This isn’t quite related, but would you know how best to clean fake aquarium plants? Ours are these Japanese silicone ones; very soft, almost fragile. Are they boilable? This is one question I won’t be any good for. The only fake plants I have ever had were yeeeeears ago when I had silk plants for a Betta. I couldn’t say how to clean these ones. I do know silicone has a very high temperature resistance (why you can get muffin pans made from it) but I’m not sure if yours are actually silicone or something silicone-like. Thanks so much anyway Ian. How did you clean the silk ones? Does one ever have to clean them really? Gee, you are testing my memory here. I can recall cleaning them after a brown algae outbreak in a new tank and I was worried about the algae staining the leaves. I soaked them in warm water and H202 overnight. Came out clean. I probably did clean them more than that, but that’s the only time I can vividly recall. Again, this was yeeeears ago, back when I had more hair. H202 should be safe to use on most decorations. H202? Um… is that a brand name or hydrogen peroxide? Soak them in something like a 50/50 solution? H202 is just Hydrogen Peroxide, I get sick of typing it out all the time, so have gotten into a bad habit of typing it out. I asked one of my friend who currently uses plastic plants and he says a rinse under hot water followed by a quick bleach dip – 1 part bleach to 9 parts water, scrubbing at stubborn bits with a toothbrush. Ooh bleach just sounds scary to me lol.. Is it really fine for the fish? Even if there’s some residue left? I think I prefer the sound of the peroxide.. ought it to be diluted? if so, what ratio? Thanks so much! Unfortunately, I cannot comment on the peroxide ratio, it’s been years since I’ve done this. Peroxide is harmless though as when it’s added to water, it breaks down into h2o – water! As long as you rinse it off. It would have to be diluted, as straight peroxide would discolor your fake plants. I’d google and see what others are doing here. Plenty of people use bleach without issues, as long as you are thoroughly rinsing before you add them back to your tank, there shouldn’t be an issue. This was a cool article. Most of us that own Bettas know that they like to chill out every now and then from their curious explorations. Our Betta ‘Vanessa’ loves to rest on the leaves of our Anubias or even just lay on the substrate. I would have never thought about the fact that these fish are labyrinths and just might prefer to have a spot to rest near the surface of the water. Good info. Yep, Betta are little buckets of personality. Vanessa is a lovely name for a fish, is it named after anyone in particular? I don’t think I have ever named one of my fish a ‘people name.’ I suppose letting my kids name them doesn’t help break that trend. A few current names include Pancakes, Fortnite Fiend and Pewdiepie.